Keep up with all the news from St Patrick's Technical College by subscribing to @STPATSTECH - our regular e-bulletin. Yesterday afternoon, a little after 4pm, St Patrick’s Technical College Year 12 Metals & Engineering student, Luke Forrest, become the College’s 600th apprentice. 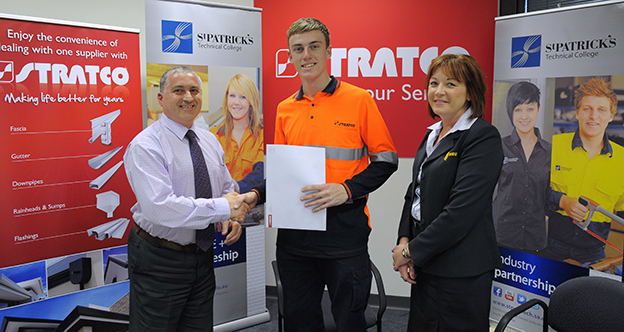 Luke has been signed as a metal fabrication apprentice by Stratco. He will complete this year in our unique school-based apprenticeship program, before transitioning to full-time employment upon his graduation in November. The sign-up was managed by Bridget Dunkin from the MEGT Australian Apprenticeships Centre and St Patrick’s Technical College Industry Relations Manager, Jim Montgomery. Others attending the sign up included Stratco State General Manager, Michael Olszewski, HR Manager, Albert Camilleri and St Patrick’s Technical College Principal, Rob Thomas. This marks an obvious and significant milestone in the relatively short history of St Patrick’s Technical College. 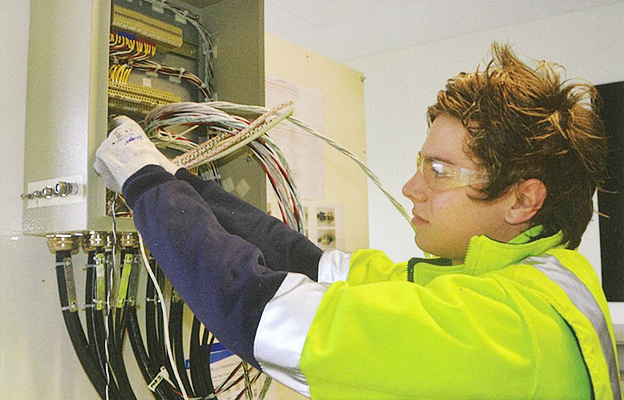 When the school commenced operations in 2007, there was only one school-based apprentice employed in South Australia in any of the trades covered by our specialist school and its programs. 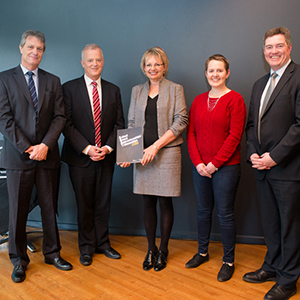 “To achieve 600 employment outcomes in the past 7½ years is a remarkable achievement for which our staff and directors (past and present), Catholic Education SA and those involved in the (now defunct) Australian Technical Colleges initiative are and should be justifiably proud,” commented St Patrick’s Business Development Manager, Patrick Kelly. This entry was posted in Industry Office, Latest News on 29/08/2014 by St Patrick's Technical College. Victoria’s passion for STEM has continued in her tertiary study, as discovered in her interview with Pam Gerrard from the Advanced Technology team. Why did you choose to study at St Patrick’s Technical College? I’ve always had an interest in Design and Technology. I was at Trinity College and one of the teachers suggested I should study something like child care instead of technology. But that wasn’t for me. So I enrolled into the Advanced Technology, Applied Engineering course at St Patrick’s. What was it like at St Patrick’s? The teachers at St Patrick’s were focused on helping us achieve, particularly with the research project in Year 12. And the Applied Engineering course allowed me to achieve my ATAR and gave me a direct entry into university. What made you select Flinders University? Flinders is the only university that offers a degree in forensics. I want to be a mechanical forensic specialist, which is the person that analyses cars that have been in a road accident. What are your plans after university? Like I said, I really want to be a mechanical forensic specialist, possibly for the SA Police or Forensic Science SA. What differences have you noticed between studying at high school and studying at university? What do you like most about it? There are more choices on assignments at university. But I think the biggest difference is that students genuinely want to be here. I really like how independent the learning is and that you need to be organised and motivated. This interview is published with thanks to Pam Gerrard, Industry Broker with the Advanced Technology Project (DECD). This entry was posted in Industry Office, Latest News on 25/08/2014 by St Patrick's Technical College. Award winning St Patrick’s Technical College graduate, Sarah Voigt (’13 Food & Hospitality) today joined Assistant Minister for Education, Hon Sussan Ley MP, in launching a new school-based apprenticeships and traineeships (SBAT) resource for schools. Catholic Education SA and the Association of Independent Schools of South Australia have collaborated in the development of the new resource to encourage schools and students to become involved in SBATs or ASbAs (Australian School-based Apprenticeships) and to give them guidance in doing so. The work was part funded by the Australian Government. Minister Ley officially launched the publication at today’s event which was attended by 80 or so Vocational Education and Training coordinators and special guests including the Director of Catholic Education SA, Dr Paul Sharkey. Sarah spoke of her pathway to employment with Hospitality Group Training / Jacob’s Creek Visitor Centre through a school-based apprenticeship and studies at St Patrick’s. Sarah has recently won a number of awards including a 2013 Australian Vocational Student Prize and the Group Training Australia SA School-based Apprentice of the Year award. Prior to the launch, Minister Ley spent the morning visiting St Patrick’s Technical College. Photographs on this post are courtesy of Catholic Education SA. This entry was posted in Latest News, Principal's Blog on 19/08/2014 by St Patrick's Technical College. Meet Jarad Hearnden, a past student of St Patrick’s Technical College. Jarad graduated in 2013 and is now in his first year of an electrical engineering apprenticeship at ASC. He is currently working on the build of two Air Warfare Destroyers, one of which will be put in the water later this year. Whilst at St Patrick’s he was appointed Trade Leader by his peers, which involved raising issues brought to him by class mates and representing his trade group at assemblies and giving reports. I was at Golden Grove High School and was keen to learn more about engineering. I transferred to St Patrick’s because they offered a course in Applied Engineering, which, at the time, wasn’t yet available at Golden Grove. What was your favourite thing about studying at St Patrick’s? I really liked the practical work we got to do at St Pat’s. For two days a week, we were out of the classroom and doing more hands-on work. I also like that we got to do extra work experience there. Why did you choose the Applied Engineering course? I wanted to keep my options open for after high school. At the time, I wasn’t sure if I wanted to study engineering at university or do an apprenticeship in electrical engineering. My time at St Patrick’s helped me figure out that I prefer hands-on work so I decided on the apprenticeship. What drew you to ASC? When I was in Year 11, staff from ASC came to our school to talk about the industry and what they do. I thought it was really interesting but I wanted to finish Year 12 first. I put in an application on the first day they opened. What differences have you noticed between studying at high school and working at ASC? Working on an Air Warfare Destroyer is exciting. Everything is bigger and better. When I was at school, I didn’t recognise how important workplace safety is. But being here has really taught me how important it is. At ASC, you get to work with different people on different areas of the ship. And you get a rostered day off too. This interview originally appeared in the Advanced Technology Project Newsletter Issue #5, August 2014. This entry was posted in Industry Office, Latest News on 14/08/2014 by St Patrick's Technical College.